Enjoying the beach life is easy at this 2BR/2BA penthouse condo, where water views stretch out in all directions. 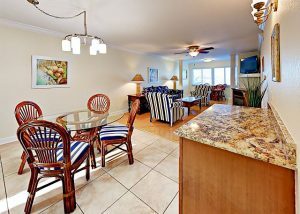 The most desirable unit in the building, this corner condo has an awesome patio area for hanging out in the Florida sunshine. Watch the dolphins and manatees play in the intracoastal waters while you splash in the shared pool at the water’s edge. Right across the street is Treasure Island Beach with free outdoor events throughout the week and Gulf sunsets that will blow you away! It’s also just a 5-minute walk to grocery stores, restaurants, salons, banks, and drug stores. The inviting living room has a winning beach-inspired décor that’s sure to put you in full vacation mode. Curl up on the couch with seashell fabric or get comfy on the two armchairs. Turn on the electric fireplace for warm ambience on cool winter evenings, and watch a movie on the 46” flat screen TV with cable.